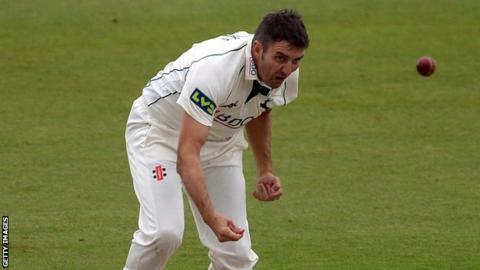 Veteran Nottinghamshire all-rounder Paul Franks has announced his retirement from first-class cricket. However, the 36-year-old, who made his debut for Notts in 1996, will continue to captain the club's second XI. "Playing for Nottinghamshire in first-class cricket has meant an enormous amount to me," Franks told the Nottinghamshire official website. "The shirt and the cap really matters. It's now about closing a chapter and moving into a new one." That new chapter will include continuing to captain the second XI, whom he led to the Championship title in 2015. "The work we're doing with the young players in the academy team and second XI is going from strength to strength and will continue to do so," the right-arm seamer added. Franks retires - a day after team-mate Gary Keedy announced his own retirement - having taken 524 first-class wickets in 215 matches at an average of 33. He also claimed 11 five-wicket hauls. He became the youngest bowler in Nottinghamshire's history to score a hat-trick when he dismissed Trevor Penney, Dougie Brown and Graeme Welch against Warwickshire at Trent Bridge in 1997, and also scored 7,185 first-class runs at an average of 28 with four centuries and 41 half-centuries. "For many years Paul's been a stalwart of the first team," said Notts director of cricket Mick Newell. "He's made a terrific contribution with ball and bat." In addition to personal success, Franks enjoyed team triumphs during his Notts career, winning the County Championship title in 2005 and 2010, and being part of the promotion sides of 2004 and 2007.